Dogs Bite Decatur Al: WINDSOR, ONTARIO CANADA - A 6-YEAR-OLD GIRL WAS ATTACKED BY A FRIEND'S PIT BULL AT A SLEEPOVER ..."I RUSHED IN THE HOUSE TO SEE HER HOLDING HER FACE ON"
WINDSOR, ONTARIO CANADA - A 6-YEAR-OLD GIRL WAS ATTACKED BY A FRIEND'S PIT BULL AT A SLEEPOVER ..."I RUSHED IN THE HOUSE TO SEE HER HOLDING HER FACE ON"
A Windsor woman says her six-year-old granddaughter suffered severe injuries after being attacked by a PIT BULL and she is calling for the dog to be put down. Pam Robertson says her granddaughter was attacked after she dropped her off for a sleepover at a friend’s house at College and Rankin on Saturday night. “I sent my granddaughter to a sleepover, she was there for about an hour when I got the call that she had been bitten by a dog,” says Robertson. Robertson says her granddaughter was rushed to the hospital and had to get 75 stitches in her face and 50 stitches on her leg. Robertson is outraged and wants the three-year-old dog put down so it doesn’t happen to anyone else. “These injuries are so severe, I can’t imagine what the owner of the dogs why she doesn’t want to volunteer for her dog to be put down,” says Robertson. Robertson says they contacted the police. Sgt. Steve Betteridge says police were contacted regarding the dog bite matter. He says there was no criminal element and the case has been forwarded to the health unit. The Windsor-Essex Humane Society says dangerous dog investigations are dealt with by the city’s bylaw enforcement department. Robertson’s granddaughter has been released from hospital and is recovering at home. 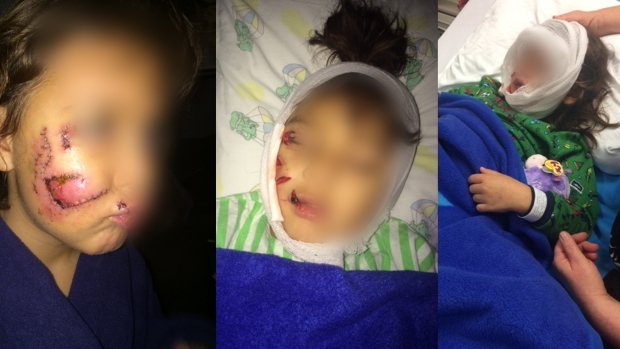 Can you imagine being grateful your child is alive, but devastated that their face was torn off? Come on pit bull advocates, when are you going to start realizing the truth? Pit bulls are NOT FAMILY PETS! Quit pushing pit bulls on society as if they were the only dog breed out there. They are not, and pit bulls serve absolutely no purpose that a safe breed cannot perform! I honestly don't care if there are a handful of good pit bulls out there, it does not compensate for all the bad things that the rest of the pit bulls do. When are we, as a society, going to stop this mental illness, and start protecting the general public, and the rest of the animal world? No one needs a murderous dog in their neighborhood or household!